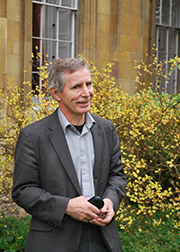 Howard Griffiths, Fellow of Clare College and Professor of Plant Ecology, discusses plants and space travel on the BBC radio programme "5 live science". Professor Griffiths showed co-host Izzie Clarke around Clare gardens (click here for the podcast), where they considered the processes of plants on Earth and their possible roles in human colonisation of space. Find out more about Clare Gardens, where the programme was recorded.